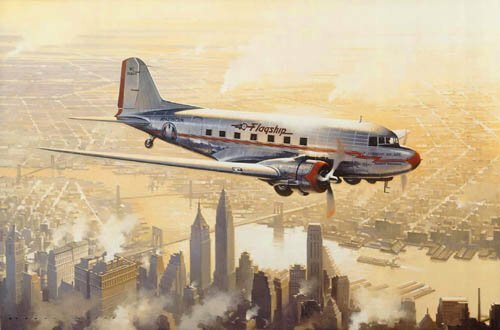 Edition Size - 100 Overall print size: 32" x 25"
Robert Watts’ fine rendering depicts an American Airlines DC-3 – one of 20 in service by 1936 with right-hand doors – outbound from La Guardia airport. Below, the distinctive Manhattan skyline and the busy New York waterfront add to the nostalgic mood of this pre-war aviation scene. Perhaps the greatest tribute to this remarkable aircraft is the fact that after almost 60 years of unbroken service, the distinctive shape and sound of the DC-3 can still be seen in the skies all around the world, performing the role for which it was built – flying passengers and cargo safely and profitably. Overall print size: 32" x 25"
Every print in the edition is signed by award-winning aviation artist Robert Watts.